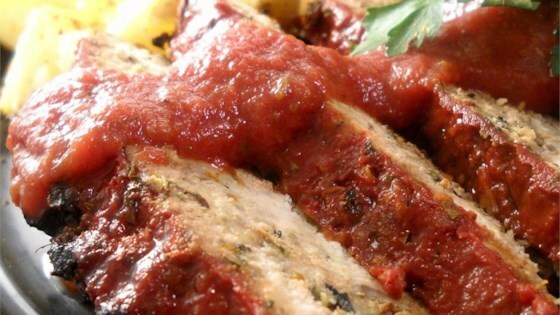 "A super moist and flavorful turkey meatloaf with the perfect complement of a tangy balsamic glaze. It's light enough to keep you on track with your New Year's resolutions and filling enough to satisfy all your comfort food cravings. Let the tummy hugfest begin without any of the guilt!" Heat 1 tablespoon olive oil in a skillet over medium heat. Cook and stir onion in hot oil until onion has softened and turned translucent, about 5 minutes. Reduce heat to medium-low and continue cooking and stirring until the onion is crisp and dark brown, 15 to 20 minutes more. Remove from heat and set aside to cool; chop into small pieces and place into a large bowl. Heat remaining 2 tablespoons olive oil in the same skillet over medium-high heat. Add carrots and mushrooms, season with kosher salt and ground black pepper to taste, and cook and stir until carrots start to soften, about 7 minutes. Stir in garlic and cook for another 3 minutes; remove from heat, add artichoke hearts, and set aside and let cool. Transfer vegetables to the bowl with onion. Mix in feta cheese, bread crumbs, egg, milk, Worcestershire sauce, turkey, parsley, and thyme; season with Italian seasoning and Creole seasoning. Adjust salt and pepper if desired. Thoroughly mix turkey mixture with hands and form into a meatloaf; place loaf on a baking sheet. Bake meatloaf in preheated oven until no longer pink inside and the juices run clear, 40 to 45 minutes. Combine tomato sauce, balsamic vinegar, and honey to make the glaze; remove meatloaf from the oven, coat with glaze, and bake until glaze has cooked onto the loaf, 5 to 10 more minutes. I find that the more compact and tall I make a meatloaf, the less likely it is to be dry, especially with turkey. If you don't want to take the time to caramelize the onions, you can just cook and stir them until they are lightly colored and softened. But if you like them, I really recommend using the caramelized onions. And since making a huge batch takes the same time as a small one, make tons! It's the perfect topper for chicken, burgers, baked potatoes and a world of other dishes! Excellent recipe but needed to scale down on the glaze. It wasn't absorbing as well as expected from recipe. Deliciouse! Very moist and flavorful! I thought it was going to be small because of the small amount of meat, but there are so many veggies that it makes up for it. This is definitely a keeper!